It's freezing outside and the snow is blowing which makes me doubly excited to share today's post with you. 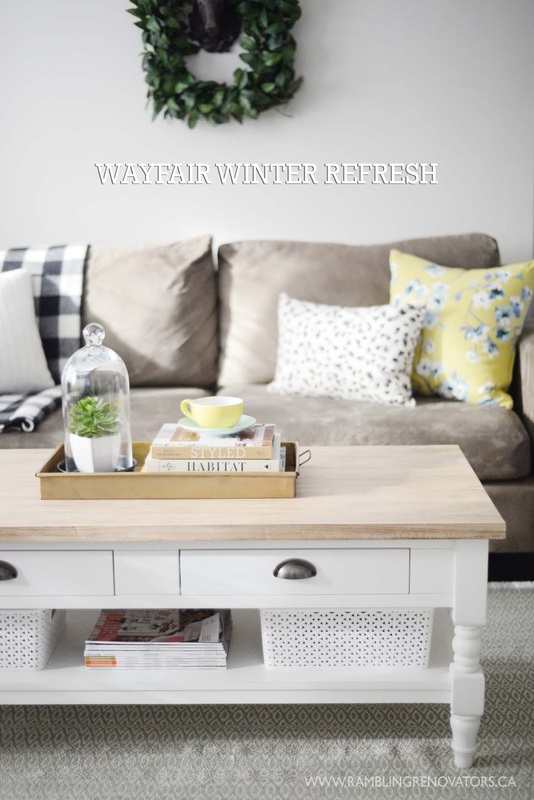 To battle the January blues, Wayfair Canada invited a few bloggers to give a space in their house a winter refresh. 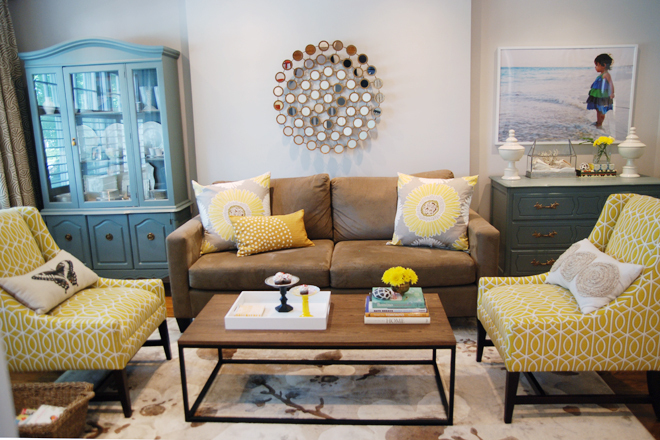 I focused on the living room, going for a bright springtime look. Here's a reminder of how the room has looked for the last few years... pretty but brown and heavy. But now the living room feels light, cheery, and updated. Our main furniture pieces - sofa, chairs, dresser and hutch - stayed the same but changing out some of the accent pieces made a big difference. I also shopped the house, and moved things around to give the room a look that's a bit more casual, a bit more country. 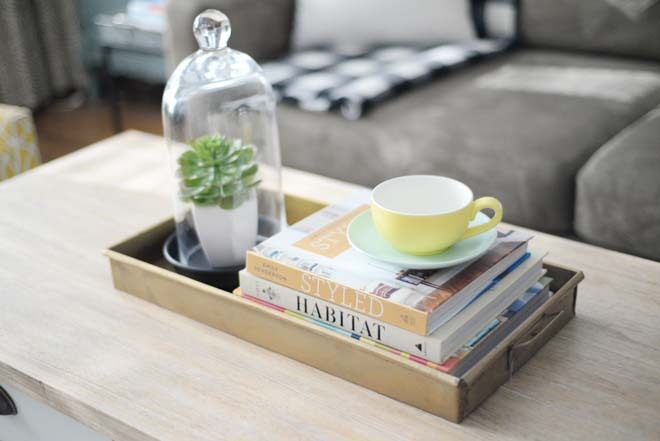 The new coffee table really brightens things up. 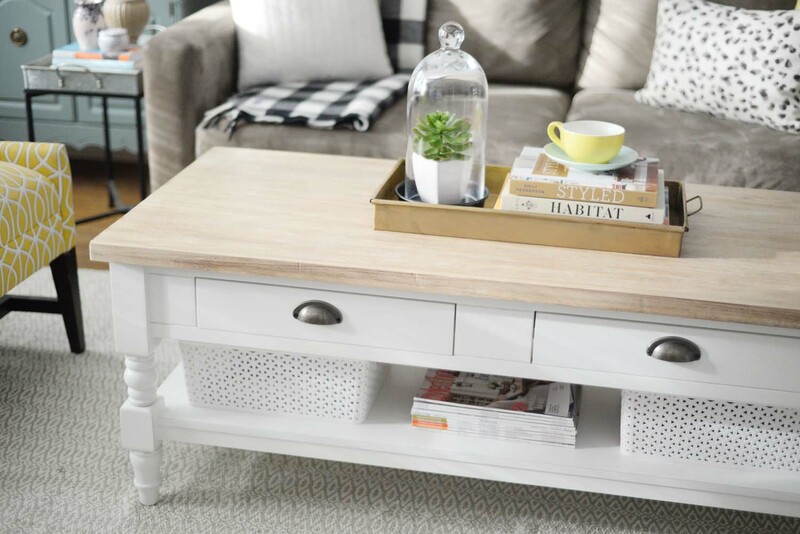 I love the natural wood top paired with a painted white base. It's slightly bigger than our old table and much more functional. Chloe is always colouring in the living room so the large wood top is great for drawing and the drawers keep her crayons handy. I like the handy shelf myself. I'm a magazine hoarder so now I have a home for all those piles! 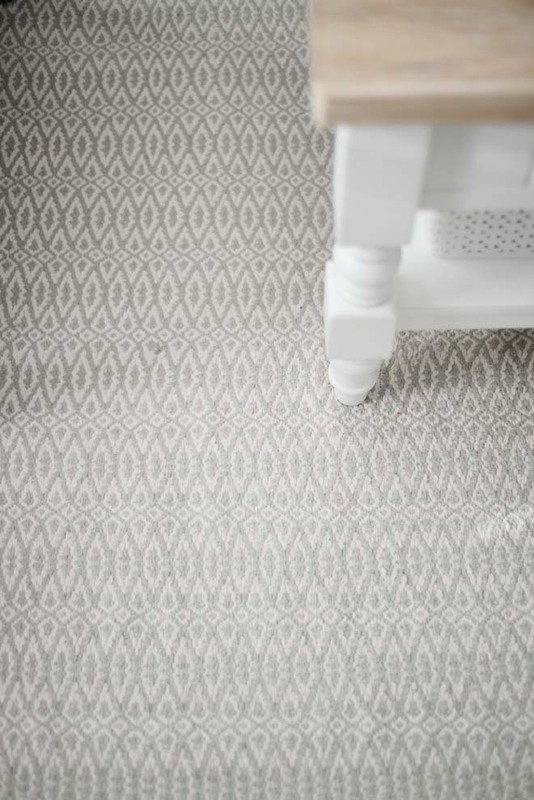 I've long been a fan of Dash & Albert rugs so I was thrilled to find this one. I knew I wanted a light rug to ground the space and cover the dark wood floors. 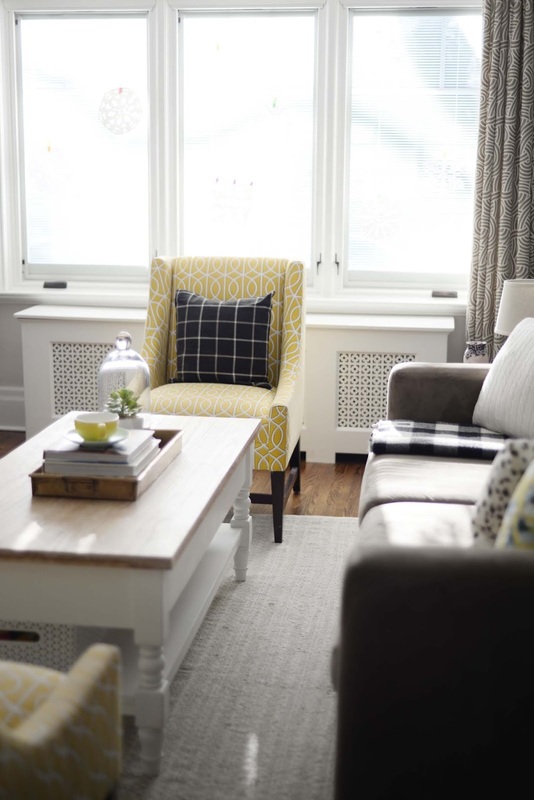 The subtle cream and light green gray pattern suits the room's colour scheme perfectly. Speaking of colour, I'm really happy we banished the brown and have settled into a cheery teal, yellow, and white scheme. The new windows are pretty fabulous too at making the room feel brighter than before. 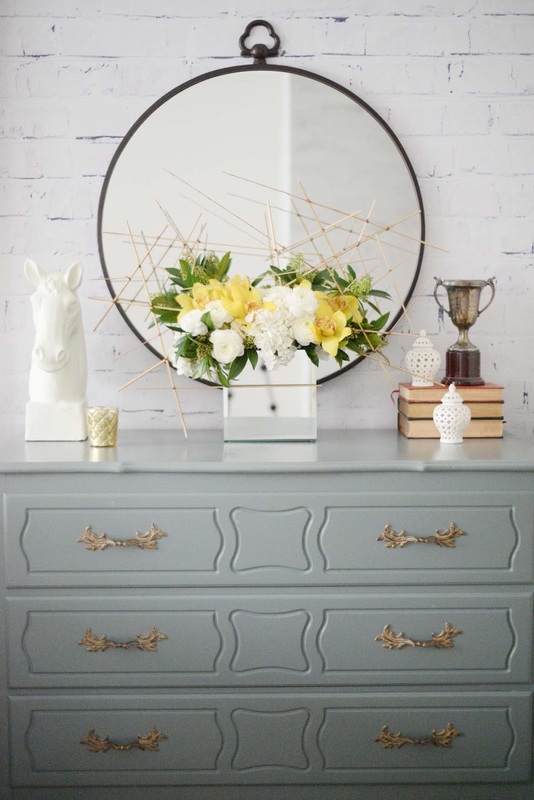 What's a blogger room without a hint of brass? ;) This brass tray is awesome. It's a good size to hold remotes, coffee table books , and small floral arrangements. I think florals of any sort (this succulent is faux) go a long way in making a room feel fresh and alive. 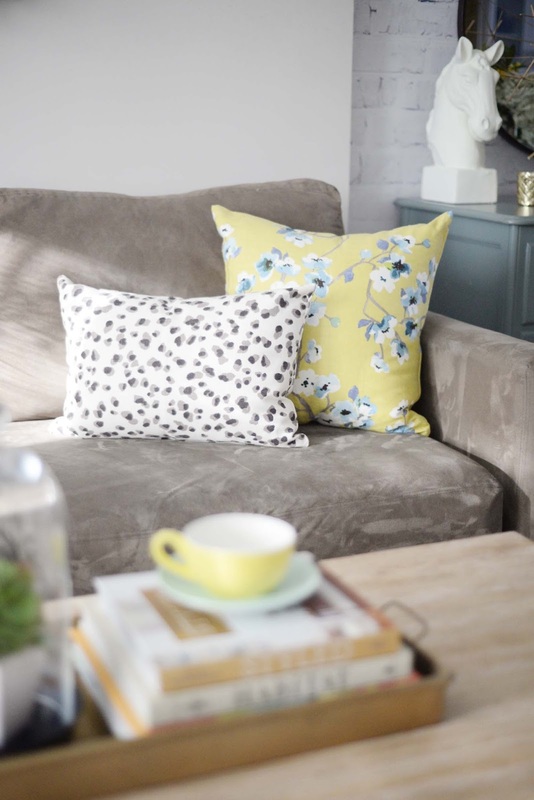 That idea is carried over to the oh-so-pretty pillows from Tonic Living. Every since I used the Sakura fabric for my sister's curtains, I knew I wanted that pattern somewhere in my house. Here it is in the Green Tea colourway, looking all lovely paired with the Lulu Leopard lumbar pillow. The dresser nook has had a bit of a makeover too. 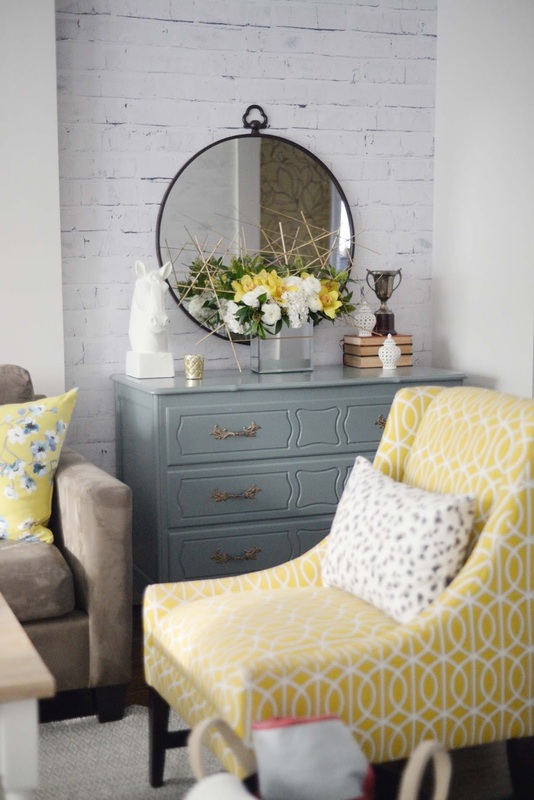 I had already picked up this mirror from HomeSense for the cottage and decided to try it against the temporary brick wallpaper. It looked great! Mirrors are ideal for expanding a space and bouncing light around the room. It is hung a bit low as the screw in the wall was measured for the reindeer head, which I've moved to over the sofa. And can we talk about these flowers for a second? 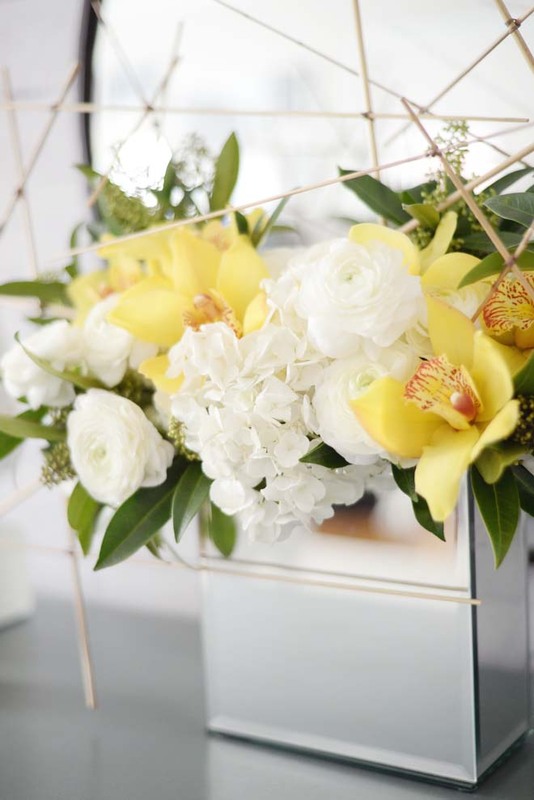 This spectacular arrangement, which is truly a floral work of art, was made by Bruno at Fresh Florals. Bruno did the flowers for my wedding (all arching grasses and cascades of orchids, bamboo, and magnolia leaves) and his work always takes my breath away. It's architectural, textured, sculptural, interesting, and memorable. 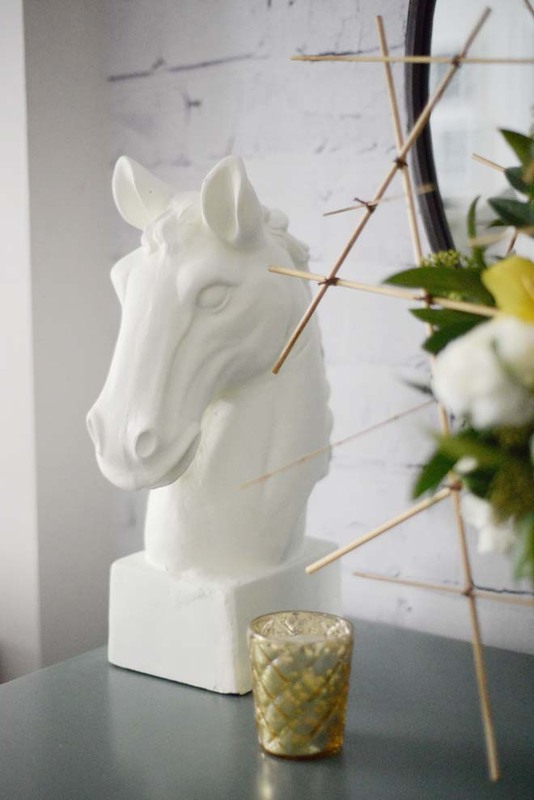 To balance the drama of the flowers, I've paired it alongside this simple and white horse head sculpture. A large scale accessory like this one makes a style statement without being too overpowering. It also brings more white into the room and brightens up this corner. 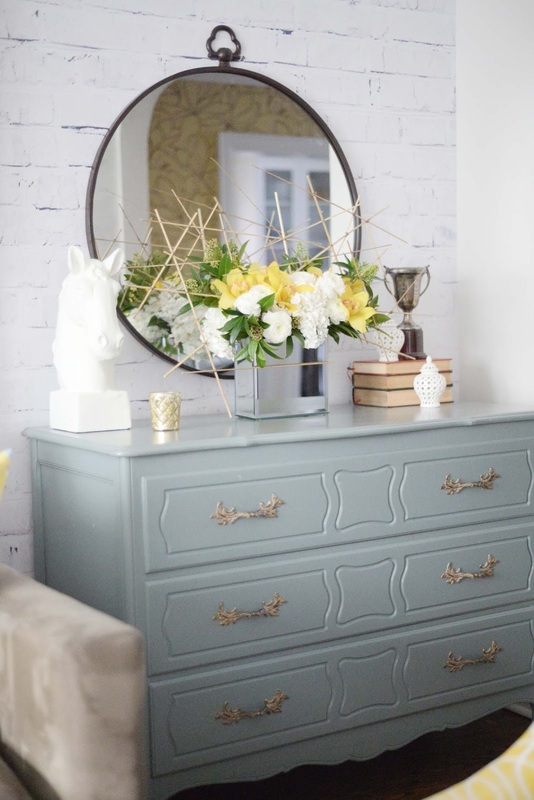 Working with Wayfair Canada on this project was a dream. All of the products arrived quickly and were packed extremely well. I love that they have products to suit most any taste. I haven't redecorated this room in such a long time that it was nice to discover how my own style has evolved. Apparently cottage-vintage-country-chic is my thing. 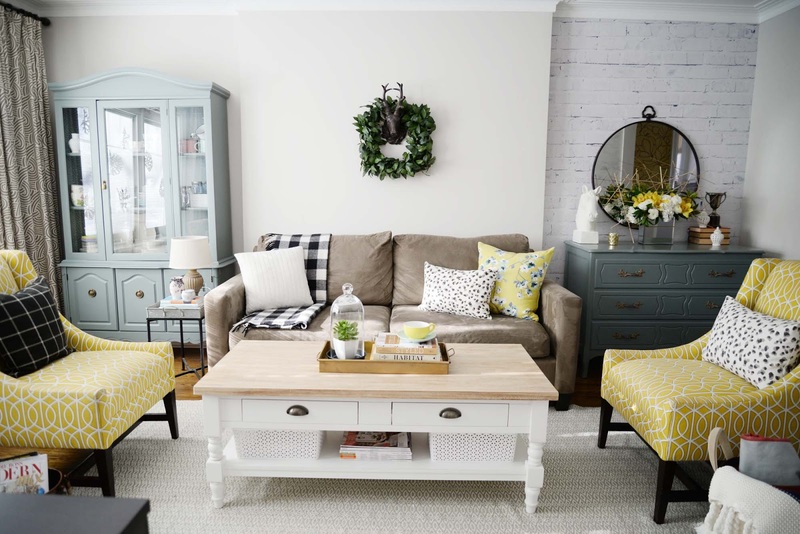 With a few key changes, and reusing old pieces in a new way, we're enjoying this room more, sinking into the cushions a little deeper and appreciating our surroundings. It feels more like home. 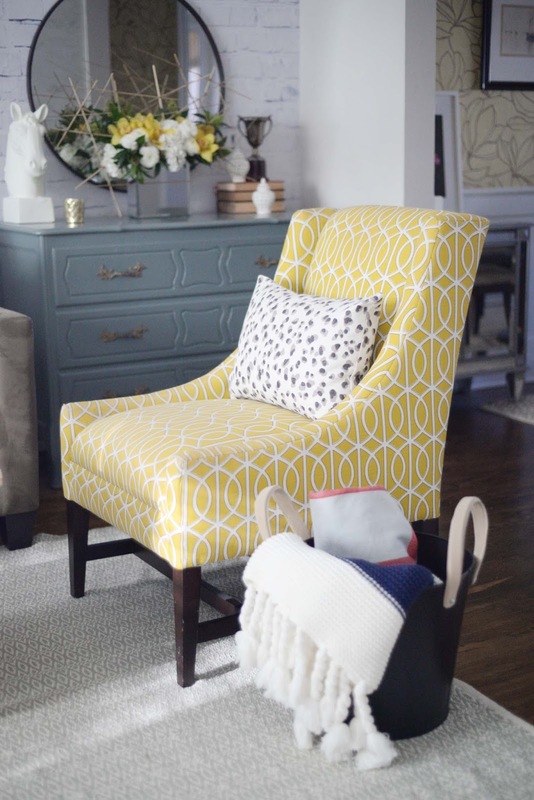 Are you tackling any room refreshes of your own? It's a great time for indoor projects!